Utrecht is a central Dutch city with a long history. The history of the city goes back to 47 AD when the Roman emperor Claudius ordered his general Corbulo to build a defensive line along the river Rhine which was the northern most border of the empire. One of the strongholds (or Castella) along the river was built at a crossing in the river and was called Traiectum (which means crossingplace). 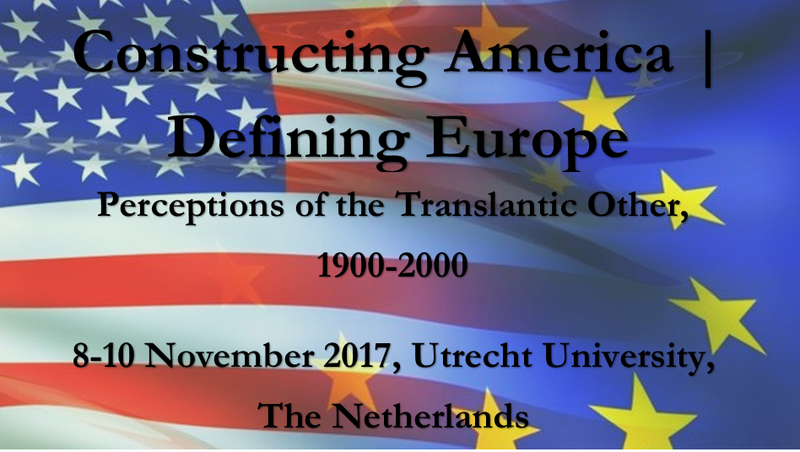 In the local language this became Trecht, Uut-Trecht (lower-Trecht) and later Utrecht. On the place where once the castellum stood now stands the Domchurch built in the 13th century. 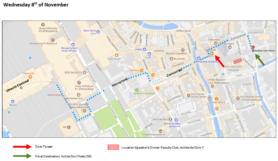 Walking is the easiest way to travel in the city of Utrecht. The center is very compact compared to the other large Dutch cities, with almost all points of interest being within walking distance to each other. A good alternative is taking the bus, which goes often and will take you nearly everywhere. Utrecht Centraal Station serves as the main bus hub for Utrecht as well as the main train hub for the Netherlands. Most buses run from early morning (around 6am) until just after midnight. If you plan to use the public transportation in the Netherlands a couple of times, it is recommended to buy an OV-chipcard. You can buy these inside the central train station or at some book stores and grocery stores. The OV chipcard is valid for bus, train and tram and works like a debit card that you must first charge with an amount of money. You could also pay for tickets in cash but these are more expensive. 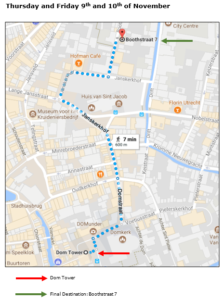 Below is the map of the walking route from Utrecht Centraal train station to the the most central landmark of the city, the Dom Tower which is indicated by the red arrow. 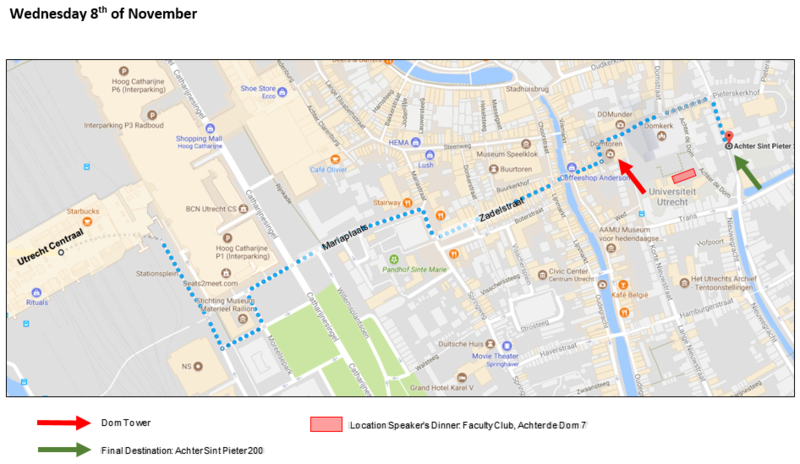 The green arrow indicates the destination: Raadzaal, Achter Sint Pieter 200, 3512 HT Utrecht- the location for CADE conference registration, the welcome ceremony and the following sessions for Day 1 (Wednesday 8th of November). Click on the map for better resolution. 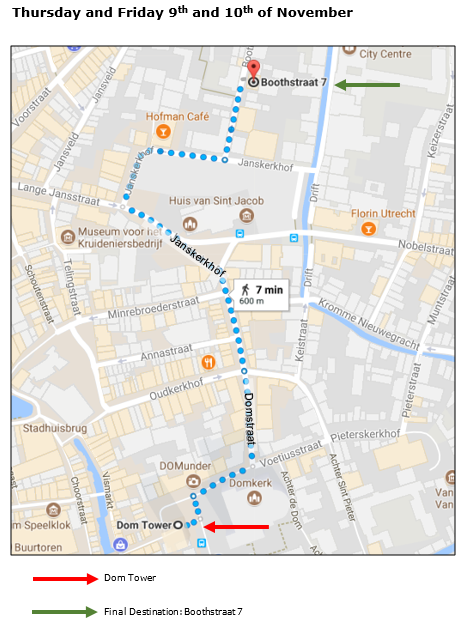 Below is the map of the walking route from the most central landmark of the city, the Dom Tower as indicated by the red arrow to the conference location for Day 2 Thursday 9th and Day 3 Friday 10th of November 2017: Zaalverhuur7, Boothstraat 7, 3512 BT Utrecht as indicated by the green arrow.